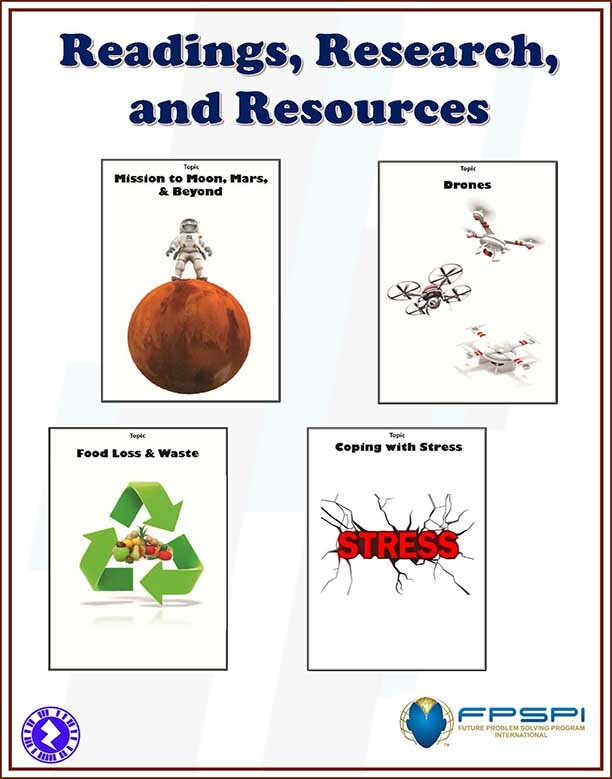 Summaries of articles which look at the first four (4) current FPS topics: Mission to Moon, Mars, and Beyond, Drones, Food Loss & Waste, and Coping with Stress from multiple viewpoints. Includes questions for discussion, terms, definitions, and a list of resources, including web sites. A must-have in preparing for this year’s topics. (c)2018 Future Problem Solving Program International, Inc. All rights reserved. The purchase of this book grants the individual purchaser the right to print the pages contained herein and make sufficient copies of said pages for use by the FPS students of a SINGLE teacher OR SINGLE FPS coach. No part of this document or the related files may be reproduced or transmitted in any form, by any means (internet, electronic, photocopying, recording, or otherwise) without the prior written permission of Future Problem Solving Program International, Inc.
Purchase does not permit reproduction of any part of the book for an entire school, special programs, school district or school system, or for commercial use. Such use is strictly prohibited. Any violation to this copyright will result in a charge of no less than $500 per incidence.